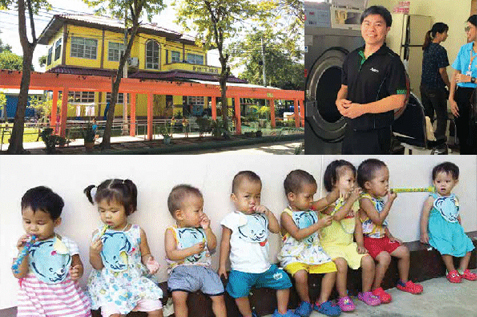 The Phyathai Babies’ Home was established in 1953 and houses babies from newborn up to six years old. At the age of six if they have not been adopted or returned to their families the children are moved to a different home. The 300 children currently living at the home have been taken there for a number of reasons. Some were abandoned and found in boxes, others had parents on drugs, many came from poverty and several were abused or given insufficient care. Others were there because the parents have been unable to cope with difficulties in their life. Lots of the babies are born from teenage girls who simply cannot look after their baby and are taken to the home straight from the hospital. It was a truly heart touching day, and everyone here at the branch is committed to supporting the Phaythai Babies’ Home with our donations again next year. We are determined not to throw anything out. Each time we think about throwing something away we will think of what we have seen and what a difference it could make to the lives of these children. Every little bit counts, as there are lots of children in need.